A Democratic candidate for Attorney General of New York promised in a video message to prosecute U.S. Immigration and Customs Enforcement (ICE) if elected. In an interview with NowThis, former Democratic congressional candidate and Fordham Law professor Zephyr Teachout outlined her support for the "Abolish ICE" movement, citing what she characterized as unconstitutional and cruel actions taken by the federal agency. "ICE has to be abolished, " Teachout said. "And I say that as somebody who is running for one of the top law enforcement jobs in the country." "There is so much wrong with ICE that goes to it’s very structure," she continued. "The idea that people are ‘illegal,' the idea that we should see immigrants as a national security threat, and that ICE should be placed under the Department of Homeland Security – by the way, the area where the president has the greatest authority to do the most damage – just doesn’t make any sense." 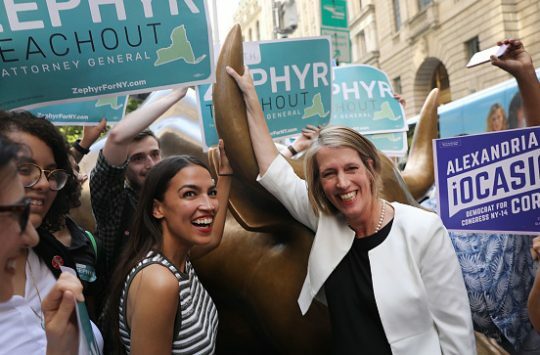 Teachout promised that if elected, "I’ll continue to speak out against ICE, I will prosecute ICE for the criminal acts." The constitutional law professor's promise comes despite the fact that the U.S. Constitution makes federal law "the supreme Law of the Land" over state laws and judges. Supreme Court precedent dating back a century holds that federal law officers cannot be prosecuted by states for conduct carried out in the course of their official duties. That immunity was later codified by Congress. In 2012 for example, California criminal charges against an ICE agent accused of running a stop sign and killing three people were dismissed in federal court. "U.S. District Judge Anthony Battaglia said long-standing federal law gives immunity from state prosecution to federal law enforcement officers accused of crimes committed in the course of their duties," noted The San Diego Union-Tribune. This entry was posted in Politics and tagged ICE, New York. Bookmark the permalink.